Sprucing up a basic manicure is simple – just add a glittery accent nail! Whether it’s because I’m too lazy to decorate every nail or because I don’t like to over-complicate things, I’m a big fan of the accent nail. It helps to elevate your manicure without going overboard – and without spending hours to get your look. This week, I took my glittery accent nail to another level … with sequins! My manicures always start with the same prep – cleaning up my cuticles, filing smooth, and a coat of Nail Tek II to keep them strong. For the color, I needed something to stand up to the sparkle of sequins, so I went with Color Club’s Reign in Spain, a bright neon coral (my iPhone photo doesn’t do it justice) that I got in my Birchbox. I applied two coats to every nail except my accent nail, which I only applied one. You need your polish to be wet for your sequins to stick, so I went through and finished every other nail with my two coats of color and Essie’s Good to Go for my top coat. Once the rest of my nails were finished, I began my accent nail! I applied a second coat of color to help the sequins adhere, and then carefully applied each sequin on my nail with tweezers. I got a small tub of silver sequins in a previous Nail Art Society kit and I figured they’d be perfect for this manicure. The good thing about sequins is that you can make them as dense or sparse as you want! I left a little bit of a gap between each sequin so you could see the color, but not so much that the color took over. 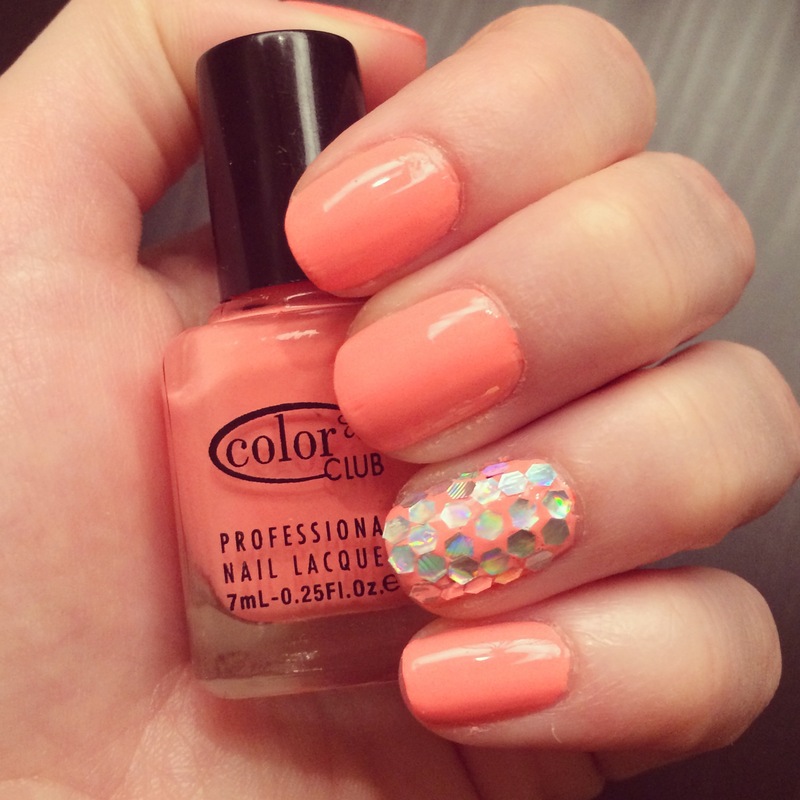 Seal in your sequins with your favorite top coat! If you don’t like the bumpy feeling of the sequins, apply a second layer of top coat to really smooth it down and you’re done! What do you think of this fun sequin look? This sherbert color is refreshing for this time of the year.